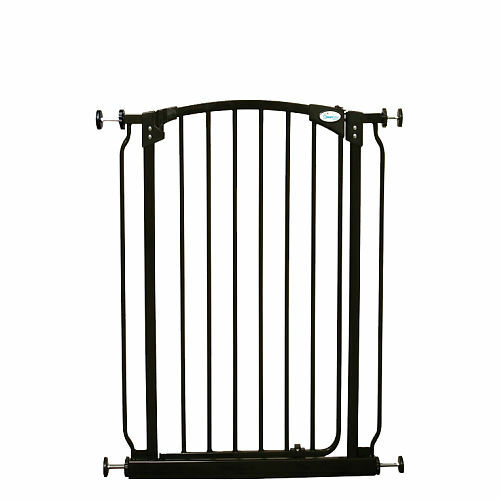 Adjustable baby gate guard with panels up to 12 feet or more. Attractive panels blend into any household style. Transparent gate to watch children or pets inside pen. Removable wall mount that leaves wall clean and unscathed. Attaches to unlimited number of panels to fit any width of space needed. Strong build prevents children from breaking through gate. Plastic wall mount may not be durable enough for all lifestyles. Growing children may outgrow gate and be able to push it over. 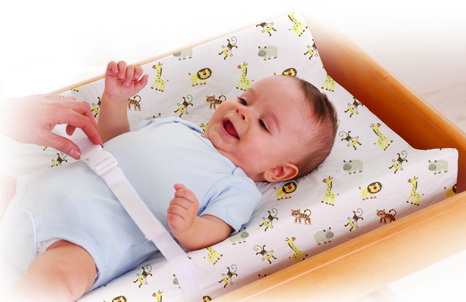 This is the summary of consumer reviews for Summer Infant Extra Wide Baby Gate & Playard. The BoolPool rating for this product is Excellent, with 4.50 stars, and the price range is $94.00-$175.00. 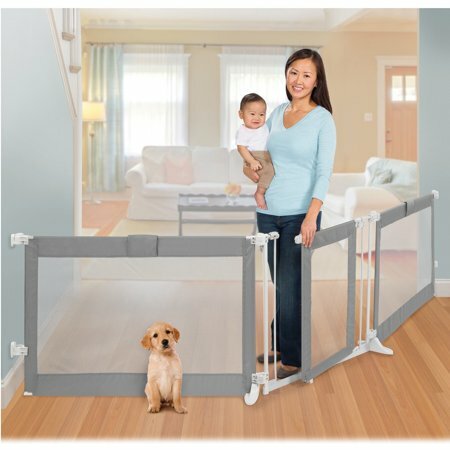 For both new and growing parents, the Summer Infant Extra Wide Baby Gate and Playard is a safe and convenient option for building a playpen for small children in a house, outdoor space, and more. This pen is unique due to its ability to attach to more panels and grow its size to fit any shape and size of a room or doorway. The mainly transparent gate that extends to 12 feet makes it easy for adults to monitor the activity of children while taking care of other activities in the kitchen, cleaning, or spending time with other adults. The gate comes with mess-free wall mounts, allowing adults to secure panels in place with a wall mount on each side that will not leave any holes or damage to a household. Some customers are disappointed about the strength of the wall mounts, that may not be able to stand up to growing children who may eventually break the plastic mount. Also, others say it can be a little shaky in strength, and the plastic bottoms of the pen may scratch delicate floors. 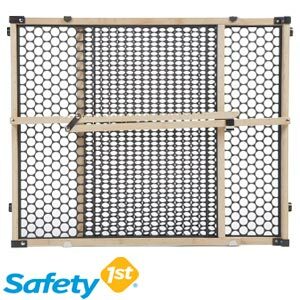 Most customers agree that for the price, this product does the trick, especially for people who have large, open spaces in their homes, or unusual living room spaces that need to be secured for small children. This baby gate is great because it adjusts up to 12 feet. I can cook without little feet under my feet, the gate keeps the little feet safe. A little shaky but does its job and extends to fit a very large length! i've a little trouble lining up the top and bottom of the door when closing but that could be my fault when installing. We've 2 doors, so one door still had the round plastic piece inside. How my little one can't climb on it. Please, everybody, check your gate doors!!! It took a little more effort than I anticipated in getting it set up and the length adjusted. The pole on the bottom of the gate door. The weld that holds the door on was broke when it came in the mail. Absolutely love this product fits our home perfectly. I gave it 4 stars only because on our berber carpet the bottom outside of the door frame slides alittle. I took my glue gun and lined the bottom of the feet and that prevented the sliding, however if they were already nonskid that'd have made this a five-star product. I've been in Childcare for 17 years and wish I'd have had this product a long time ago. We still have 3 of the gates, so it's not a bad product. I believe this's a very good product and worth the money. 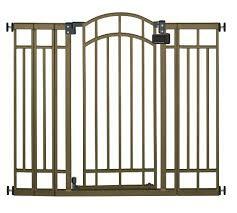 I purchaesed this gate for my home daycare and it works great. I do believe if it were possibly 8 ft the item may be too long and hard to configure. We're using the gate at the bottom of our stairwell. I like that I can adjust the panel length and somewhat modify the setup of how I want to set it up. It's amazing because you've the option of using 2 or 3 panels and the panels can also be adjusted individually. using with 2 panels attached to my porch 4x4s. Using all 3 panels isn't an issue. I was worried I wouldn't be able to adjust the length of the panels before purchasing. My only problem was we wanted the 2 main panels only (i.e. no gate). But the connector arrangement expected the gate to be the second panel. with 3 panels it was too big, with 2 it was too small. We don't have a regular sized doorway leading to the kitchen but an open floor plan from living room to kitchen. I like that I can adjust the panel length and somewhat modify the set up of how I want to set it up. If you only use 2 panels, and you've molding, you'll have to raise the spot to attach the anchors or make an adapter piece to match your molding. This gate is excellent because it's wall mounted and has a passage door. But can't get pressured mounted between walls right away. We installed it on the kitchen-side walls of the opening between our kitchen and living room. When I finished mounting it to the wall I noticed the overall flimsyness. Durability- wondering- since kids 1 & 2 1/2 yrs like to lean against cloth "walls" holding up so far we'll see. Without the gate / wall he can easily get into the kitchen and get into trouble. My son is very strong, the first time I installed it he ripped one side of it right out of the wall. We put two gates together to make more of a wall than a gate to keep our toddler in the living room. The wall mounts they gave were so cheap and we'd to get metal ones (we didnt have studs). I'm happy about not having to put holes in the walls and it can be moved easily. Works great and keeps grandkids safe. It works great to keep my 15 month old out of the kitchen and dining room. Works great to keep baby on porch!. So far, very sturdy and keeps my 9 month old safe inside. Keeps the little one out of the kitchen. one keeps my toddler out of the kitchen area. It's standing across our pocket door, and keeps our active 9 months old contained very well. Of course I bought this to keep my dog out of my front room and have no children anywhere near it so I can't guarantee from a safety standpoint that it's a good product for small children. just wish it'd straps to keep mesh tight when not expanded all the way. We bought this product to keep our 2 year old away from the wood stove and needed one that'd go up to 12 ft wide. 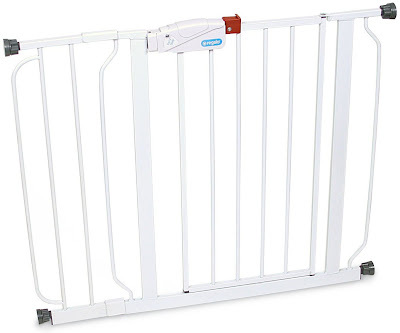 Sturdy, adjustable, and the gate is easy for my older kids to open and close, and for me to open and close one-handed. It works great for newer homes with large open floor plans cuz it's the only gate I've found with enough length to span across the room opening. My kids can open and close the door with ease. It opens in both directions. Sturdy, adjustable, and the gate is easy for my older kids to open and close and for me to open and close one handed. It's easy to open, which is a good thing for me because my 3 yr old can easily open and close it. They're very sturdy and the door is easy to open and close. I USED THIS ONE FOR THE WIDE OPENING BETWEEN MY KITCHEN AND FAMILY ROOM. I bought two of them for my home because I've two really wide openings and they work perfect. This gate is reasonably priced compared to any other that opens as wide. :) I plan on buying another one of these gates to put in my other large opening in my second living room. Sturdy, easy on the eyes, easy to assemble, and affordable. Works great, its easy to install and very sturdy. The door is easy to open and close, and it's easy to expand. This was easy to install and does a good job of "fencing off" a large opening between rooms. Was easy to set up, looks good and works wonderful. It's easy for us to open and not have to worry about the baby opening it. I love that it's expandable to any size room, very safe, and the entry door is easy to open and close. It was large enough and the insulation was easy. It works well is easy to set up and take down. It's exactly what I needed to keep my 9 month old in the family room and away from the kitchen, basement stairs, etc. I have a large opening and it fits great with room to spare. Fits perfectly in my large living room/dining room area so I know my LO always has a safe area to play in. Excellent for the price, easy to install and use. This really works for 102" opening between kitchen and living room. We needed to separate the living room from the dining room and kitchen. Bought this to block off a grand piano in our dining room to convert the room into a play room for my daughter. We've a 13 ft. space between our kitchen and living room and this gate works perfect. It was a perfect fit for closing off the living room. Bought this gate because my best friend has the same one and it's the only one either of us could find to fit the large area between our similar living rooms and dining rooms/kitchens. We placed it between the kitchen and the living room. I purchased this item as a room divider to keep my dogs out of another room. It's exactly what I needed to keep my 9 month old in the family room and away from the kitchen, basement stairs, etc. I've a large opening and it fits great with room to spare. Review of - Home Safe Extra Tall Walk Through Decorative Baby Gate, 28"-48"
Summer Infant Extra Wide Baby Gate & Playard, 65"-86" or 96"-141"